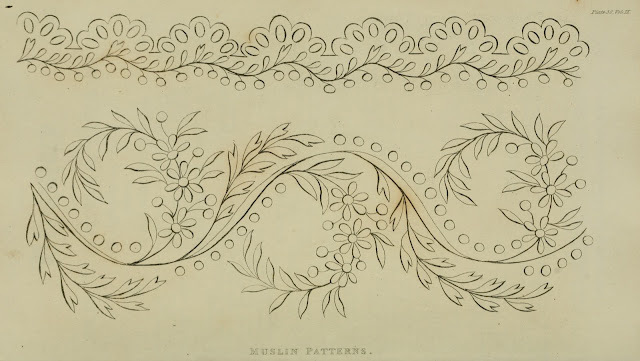 When ladies embroidered in the Regency period their work could be done in colored threads and yarns or also white on white - this type of embroidery is known as Whitework. 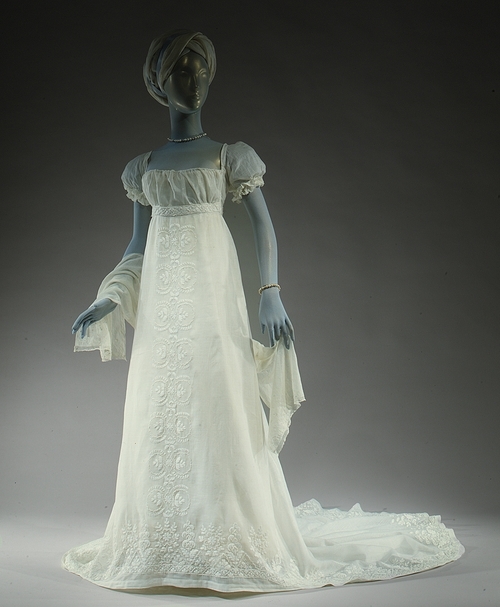 A large percentage of Regency dresses created were in white, especially for the unmarried ladies and to allow them to be interesting embroidery, trims and other accents were needed to keep them from being dull and boring. One common used form of embroidery for interest was Whitework. 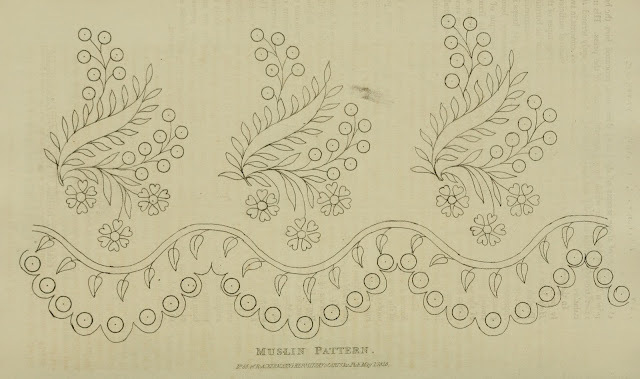 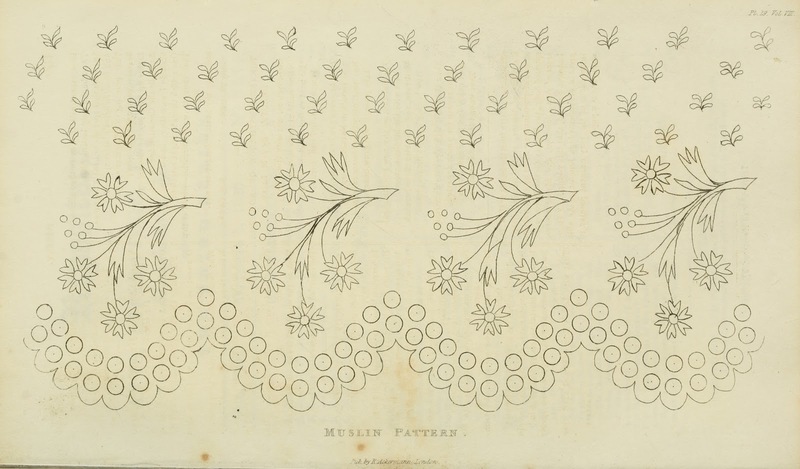 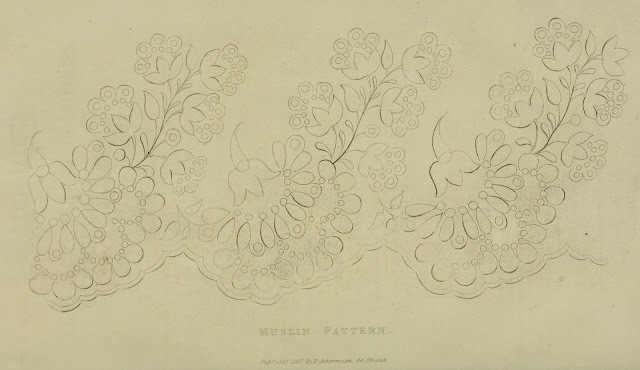 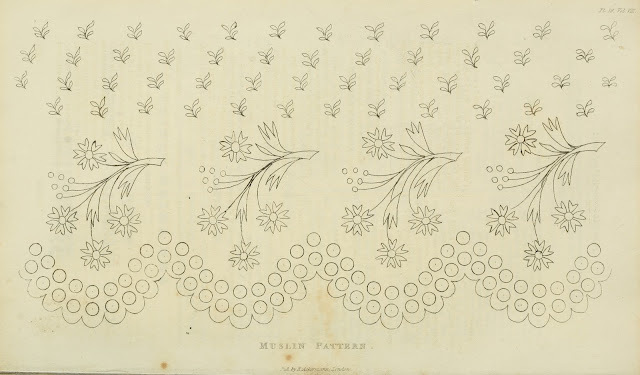 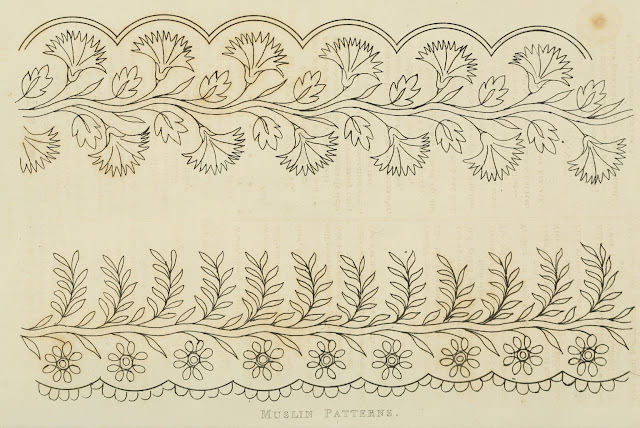 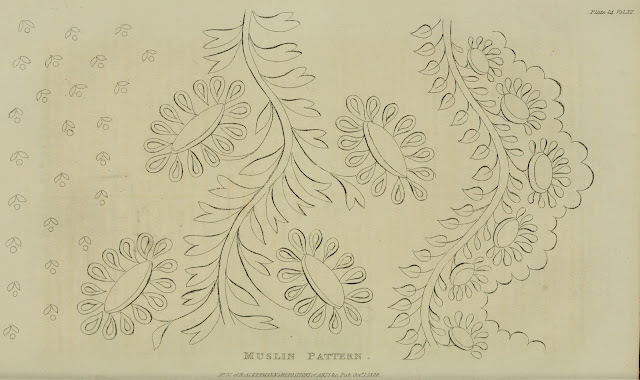 Whitework - embroidering white thread on white fabric - was often done on cambric or fine muslin for dresses, cuffs, collars, handkerchiefs, bed linens,tablecloths and baby clothes. 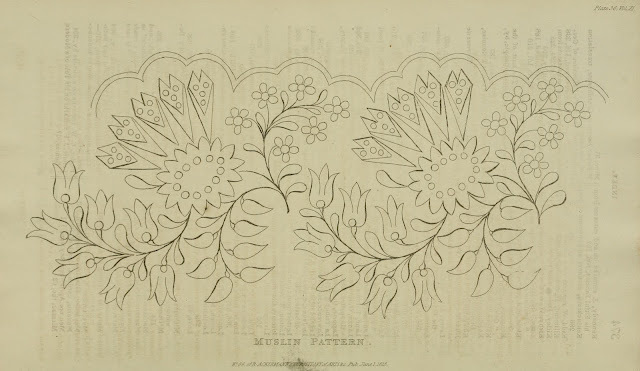 Family would pass down an exceptional embroidered christening gown as an heirloom, these were usually done in whitework. 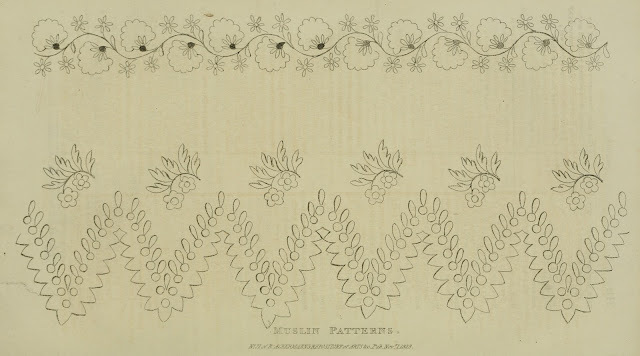 Ackermann's Repository did not always print a needlework pattern in every monthly issue in earlier years; however for the final three years of 1826 - 1828 there was one in every issue. 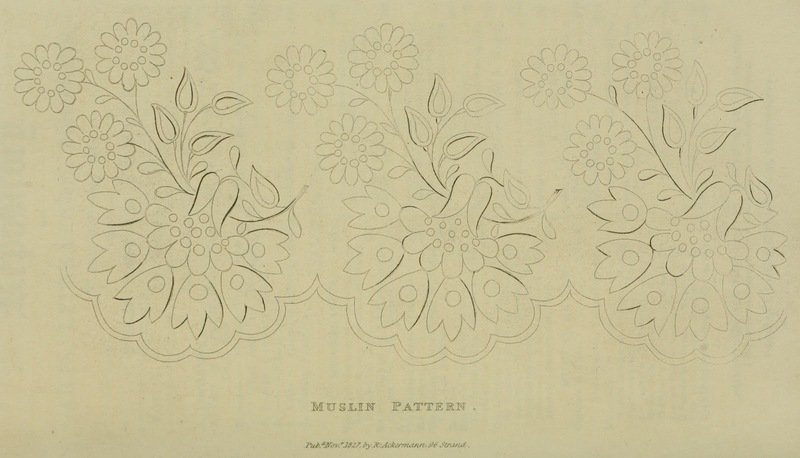 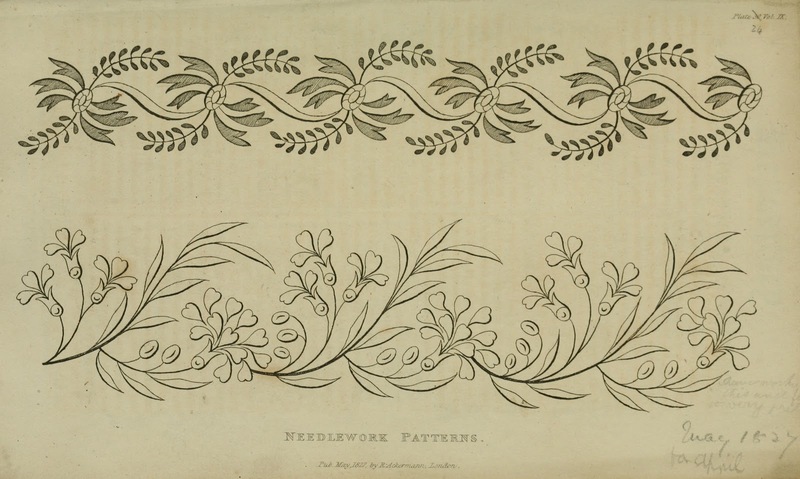 This just goes to show patterns for needlework and embroidery were popular and desired by the readers. 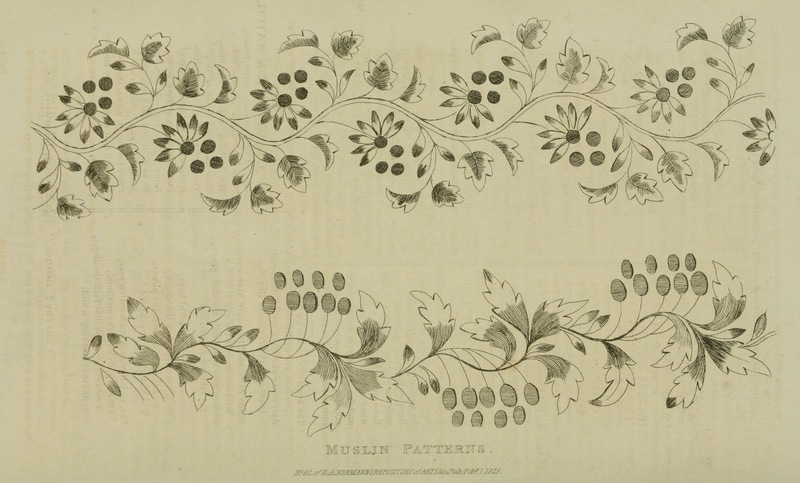 in the 1826 - 1828 issues of Ackermann's Repository. 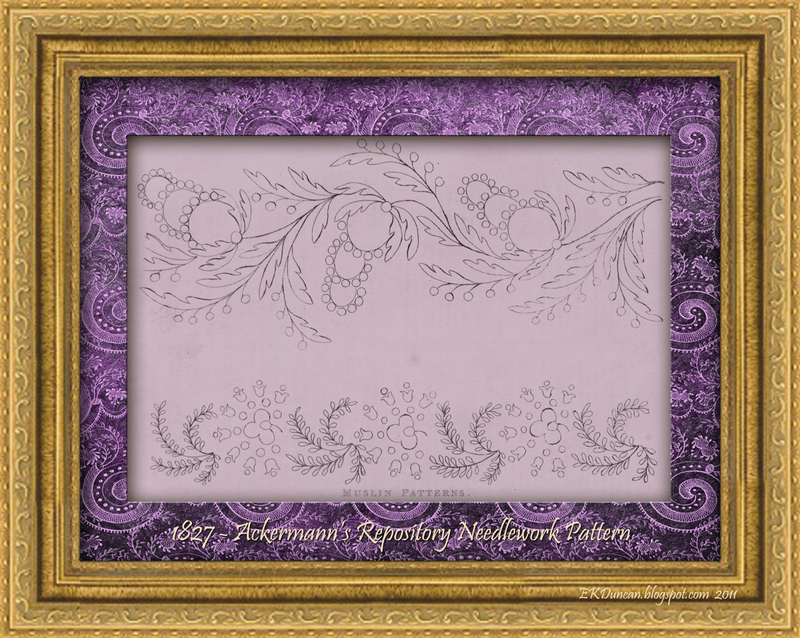 and were thrilled to add a new one with each issue of Ackermann's Repository. 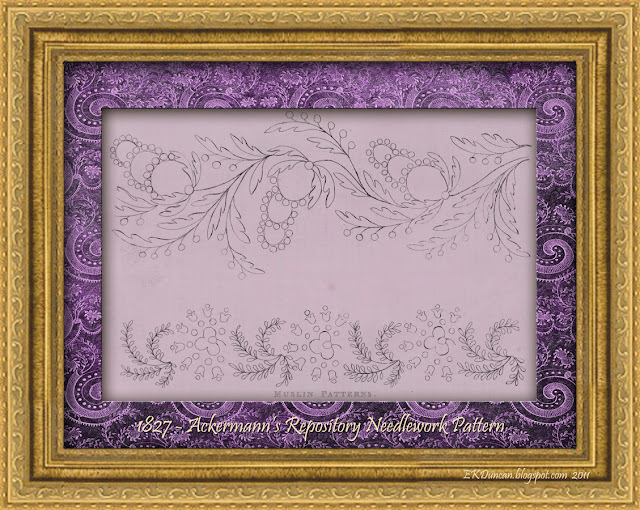 Ackermann's Repository would change a plain dress into a work of art. This evening dress is from the collection at the Metropolitan Museum. 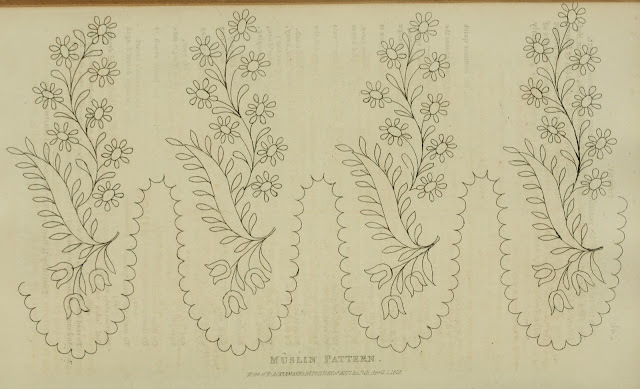 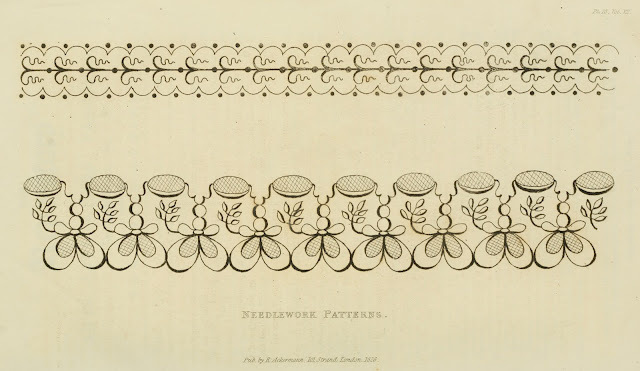 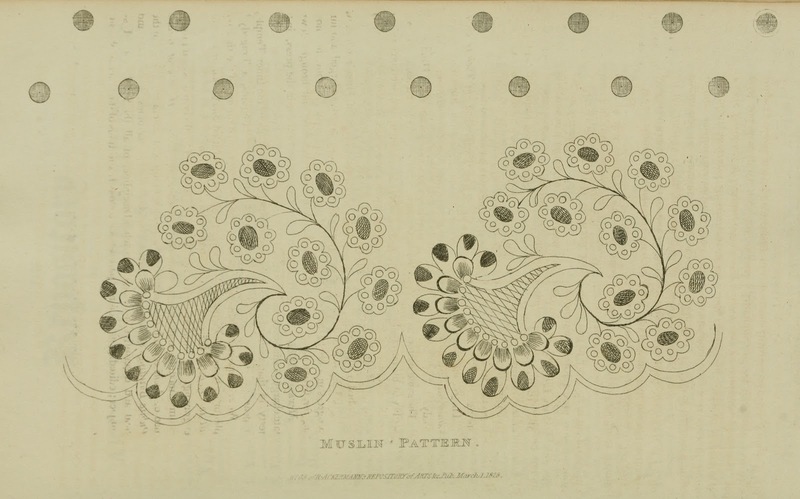 Ackermann's Repository published it's first 2 needlework patterns in 1811 and with their success published 11 in 1812. 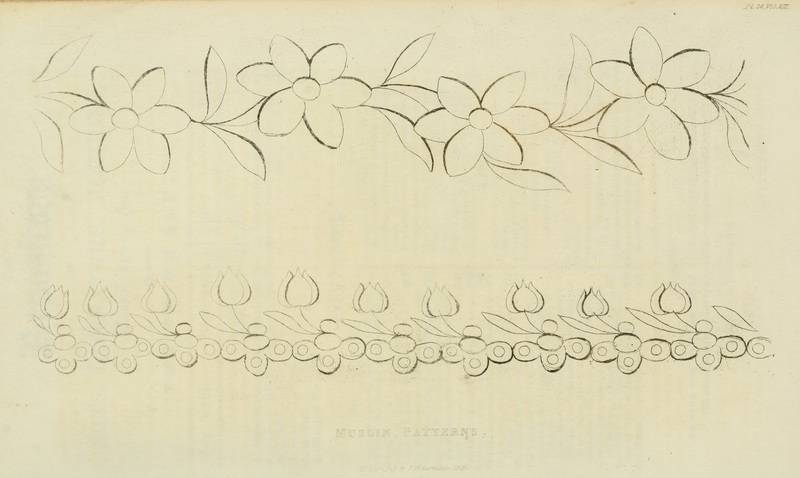 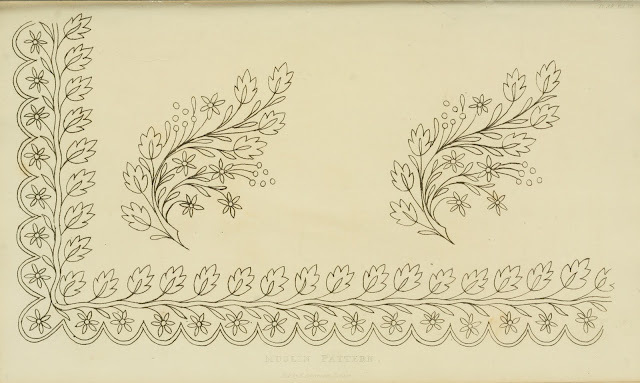 For the most part a needlework or decorative pattern of some type was found in most issue of Ackermann's Repository between 1811 and 1828. 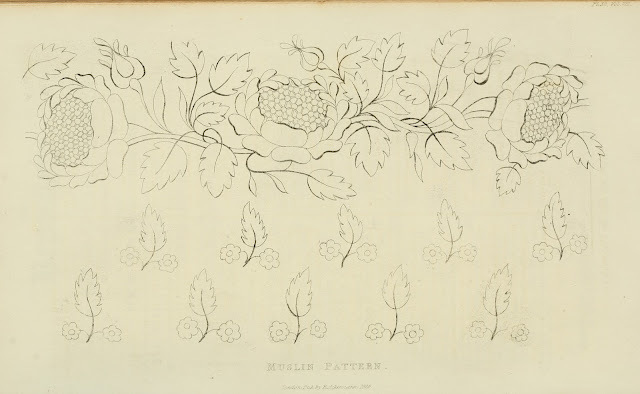 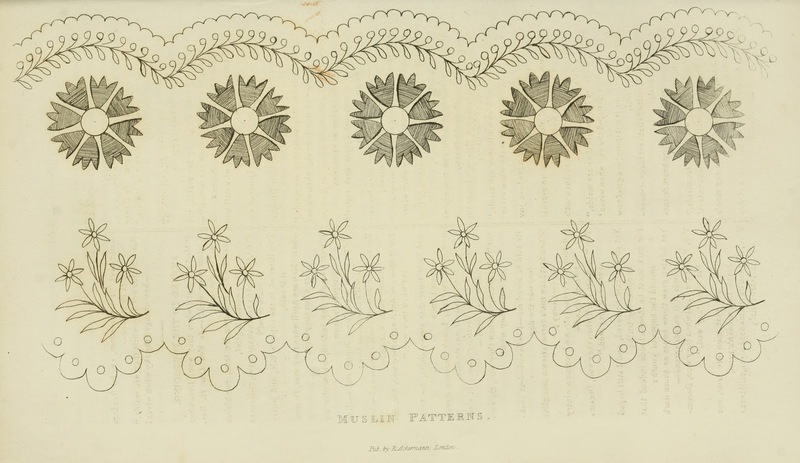 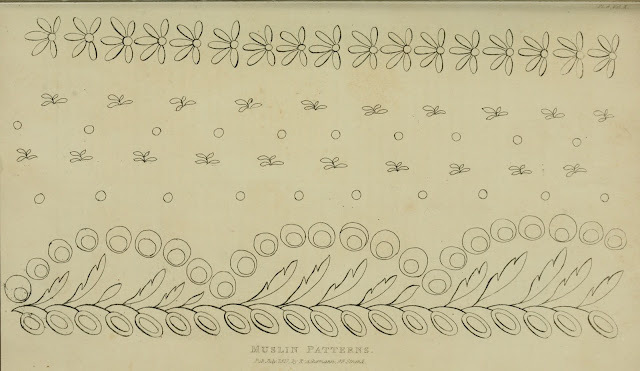 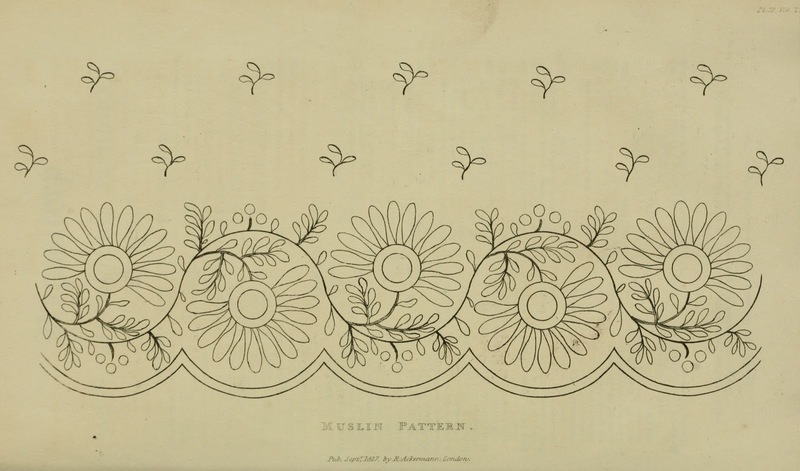 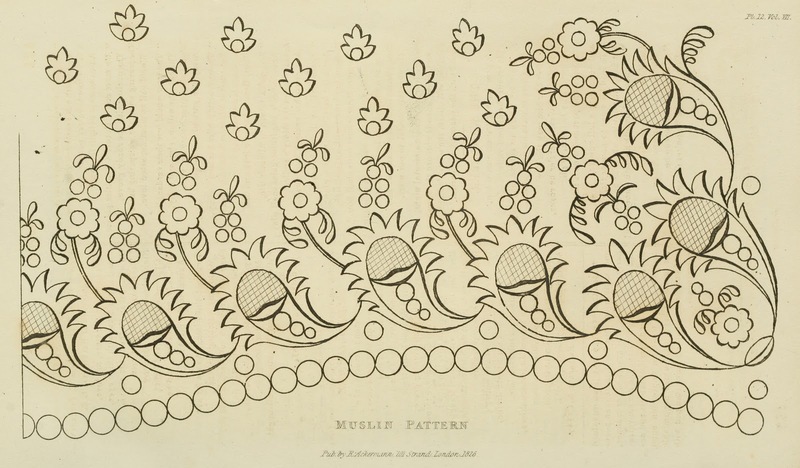 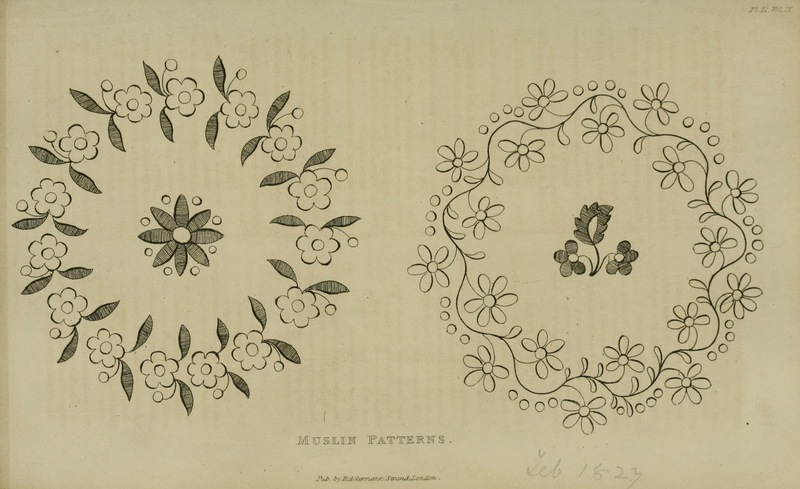 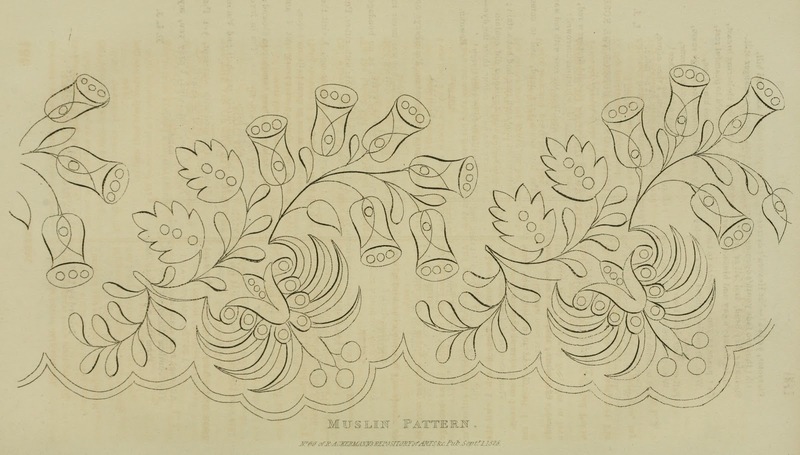 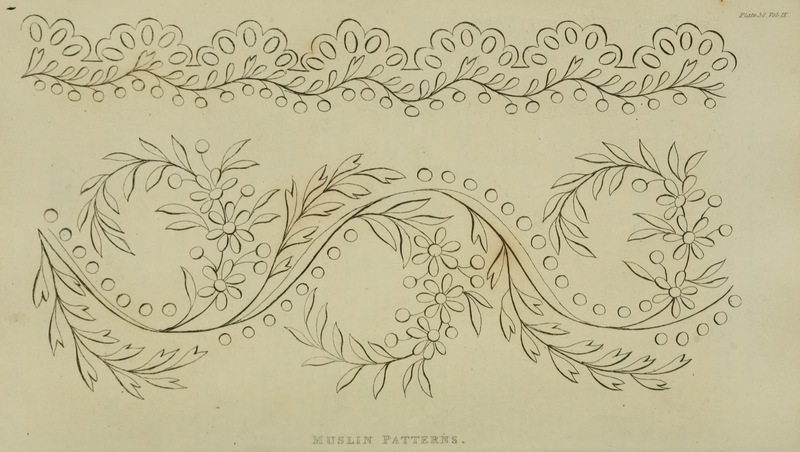 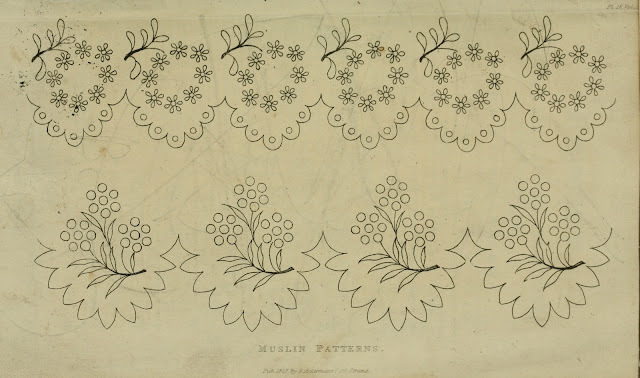 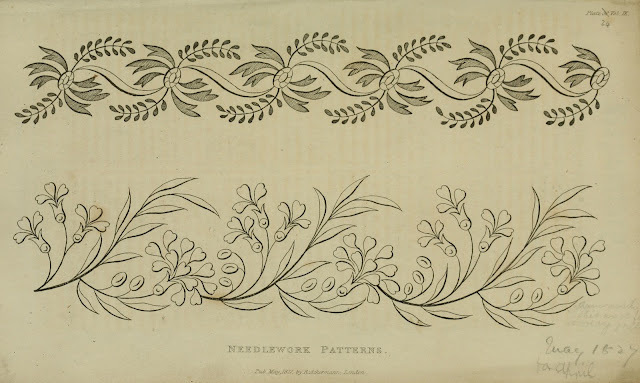 For the years of 1819 - 1821 there were fewer of the needlework patterns and more of the decorative arts patterns. 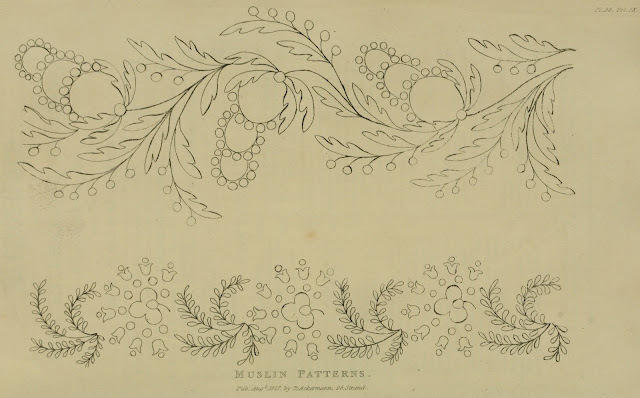 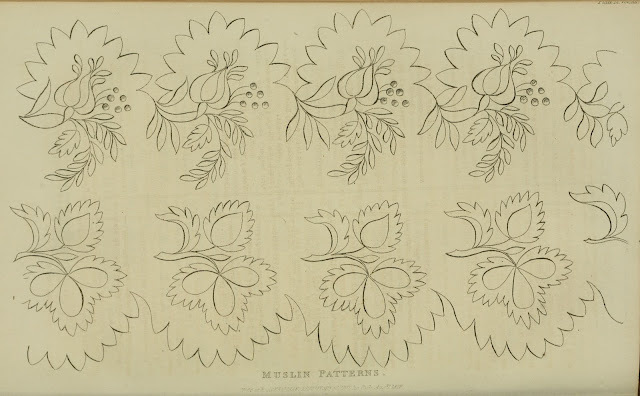 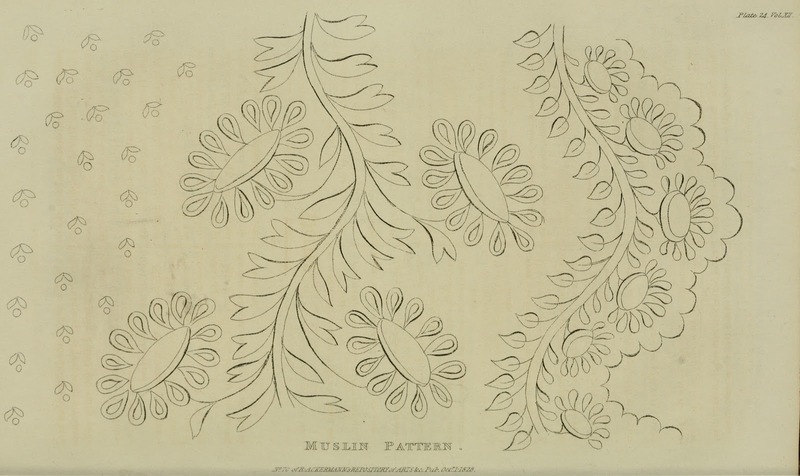 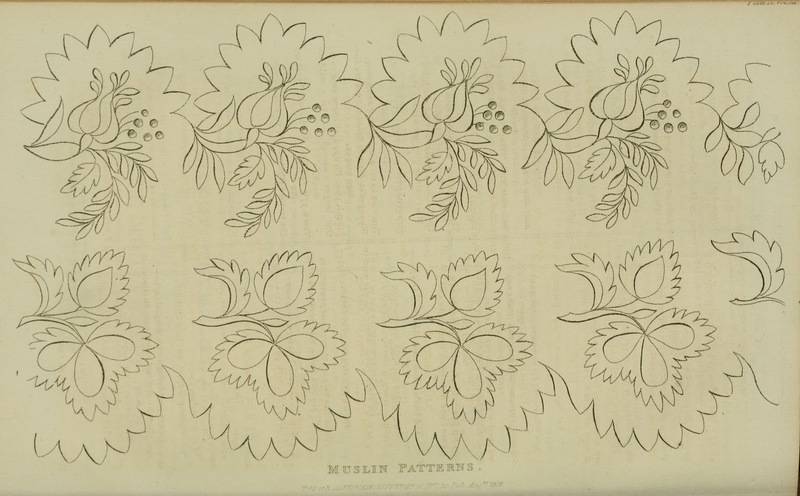 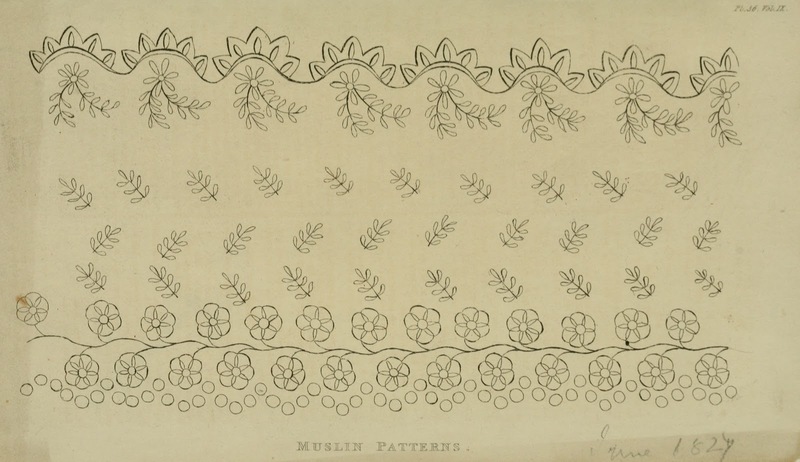 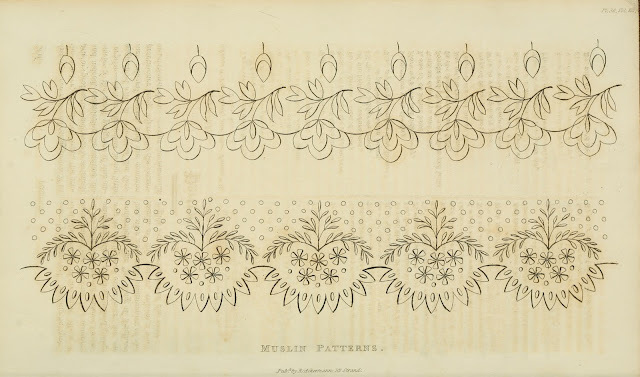 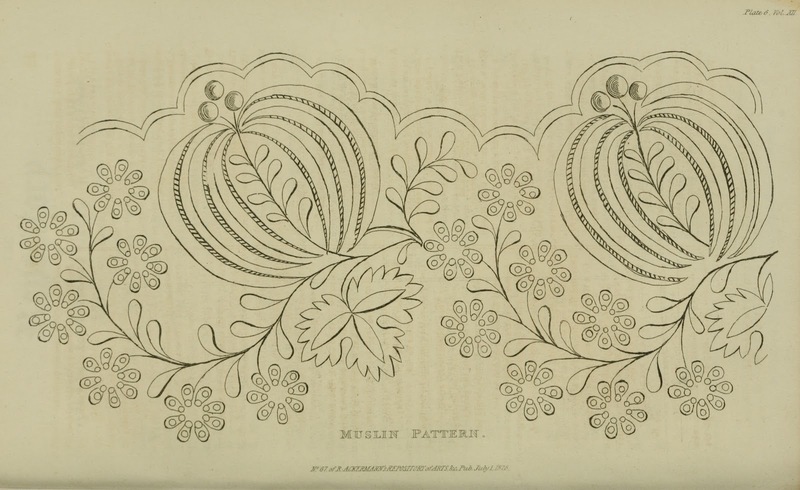 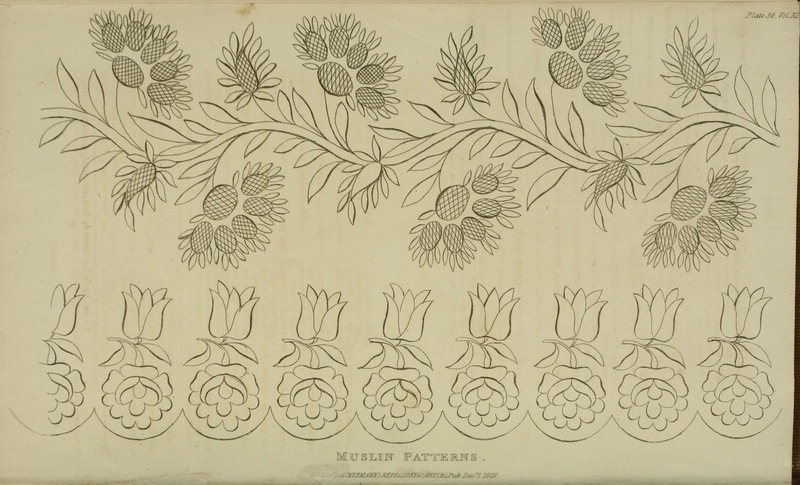 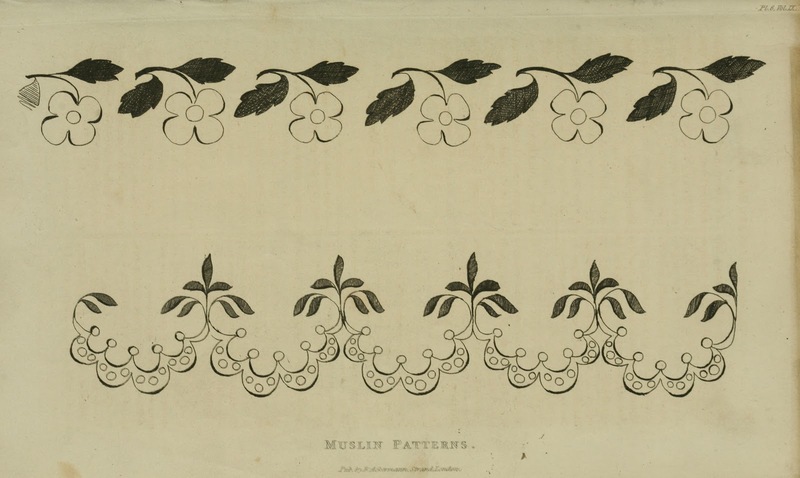 Then by 1826 there was a needlework pattern in every issue till the final installment on December 1828. 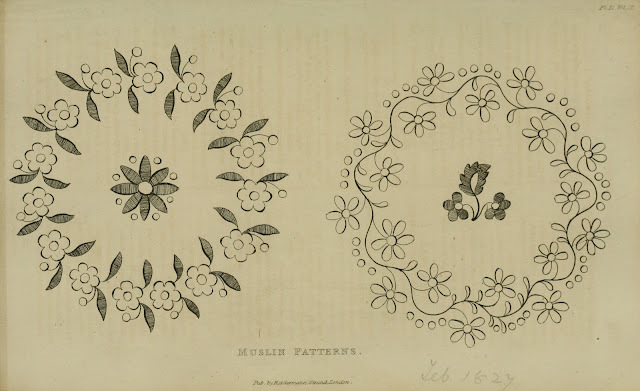 My next post will be to show the decorative arts patterns that appeared in place of needlework patterns so I hope you join me again next time for more great finds from Ackermann's. These are breathtakingly lovely. 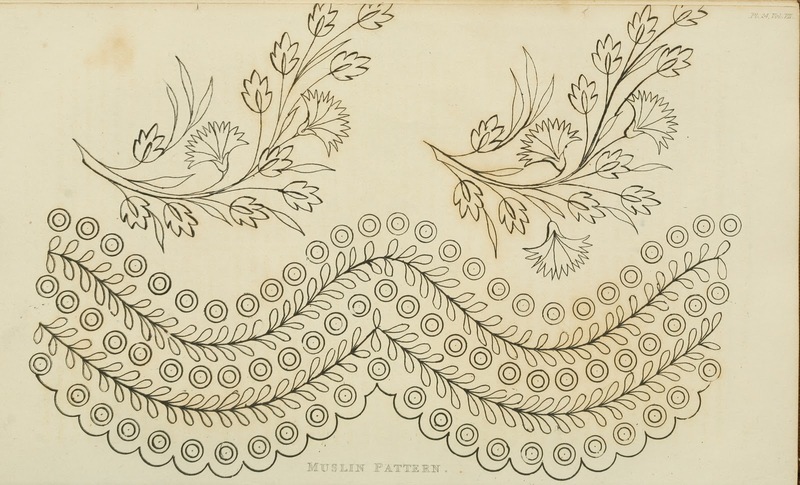 I could just stare at them all day. 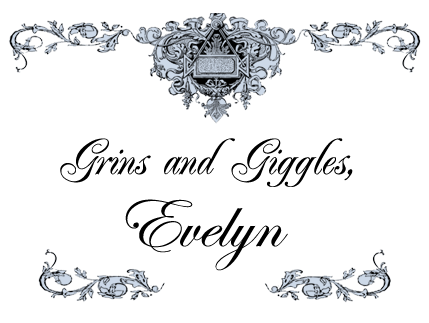 Thank You ever so much for sharing them, Evelyn! 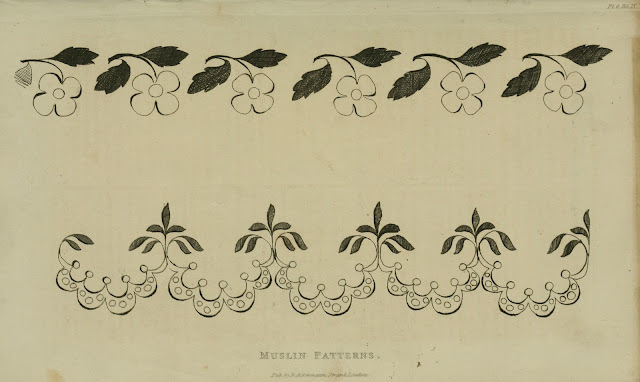 Hi Mel - Thanks for letting me know you enjoyed seeing the vintage patterns. 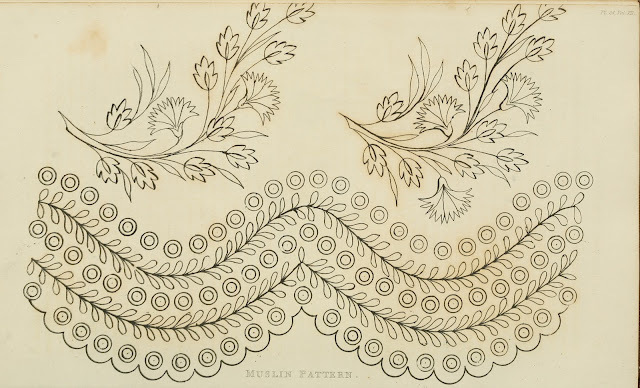 I think they are a treasure too and am glad to share. 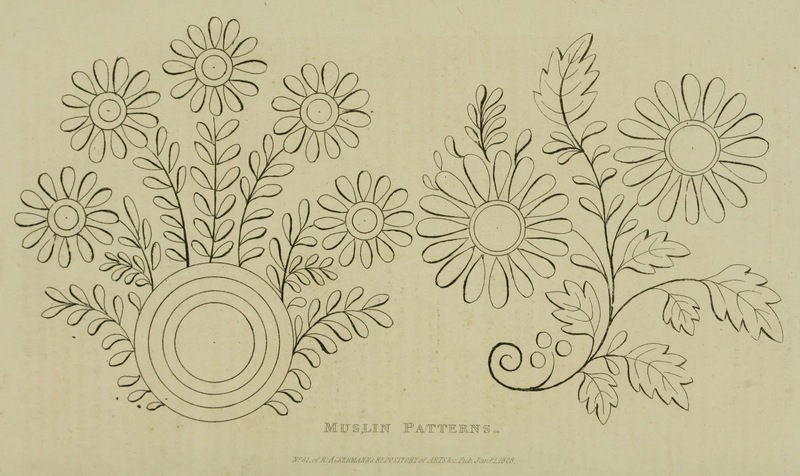 Thank you so much for allowing the download of these wonderful designs! 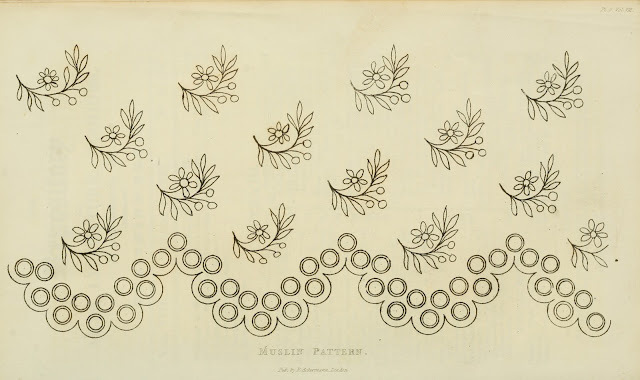 I am a volunteer for the Mary Washington House Gift Shop in Fredericksburg VA and I have been looking for some designs to use for making textiles! 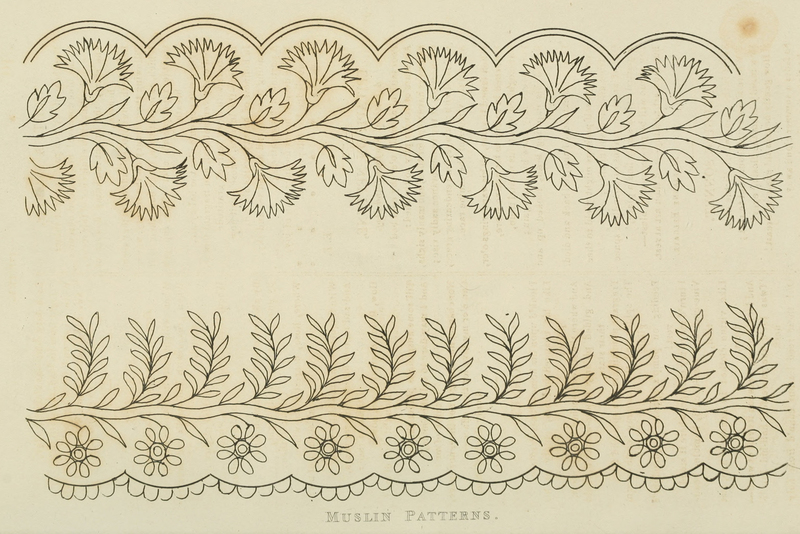 Hopefully to sell in our shop! 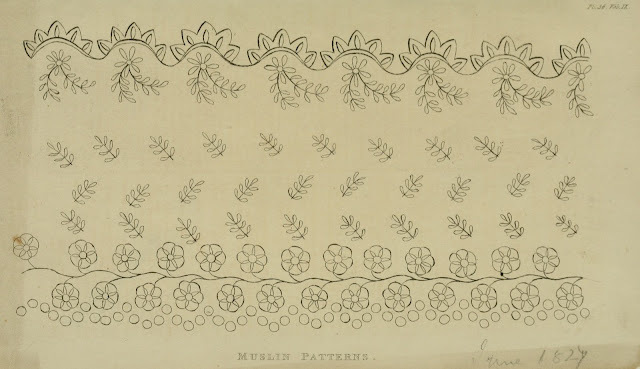 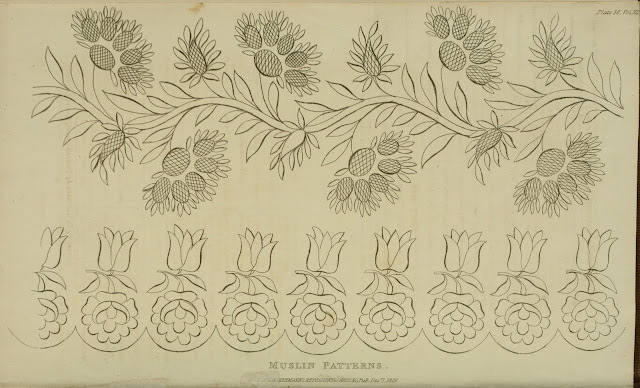 Hey Tansy Annie Studio - I love these old patterns and am glad to hear you will be using some of them to create textiles. It's great to know they are still being used 200 years after they were originally published. 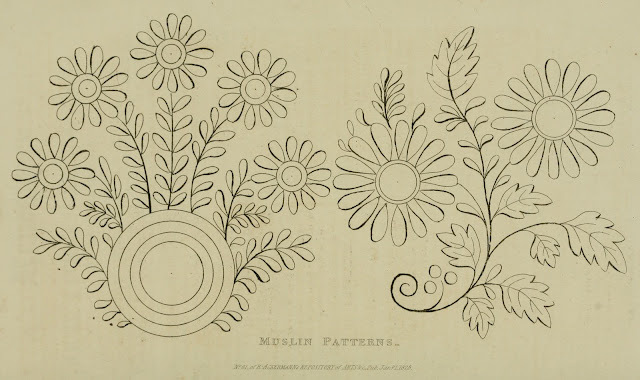 I can't wait to add some of these designs to a couple of my pillowcases! 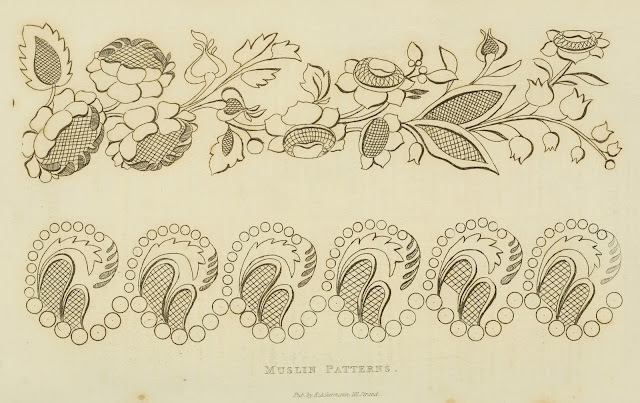 How do you feel about using them on already patterned fabric? I'm so glad to hear you like the patterns. 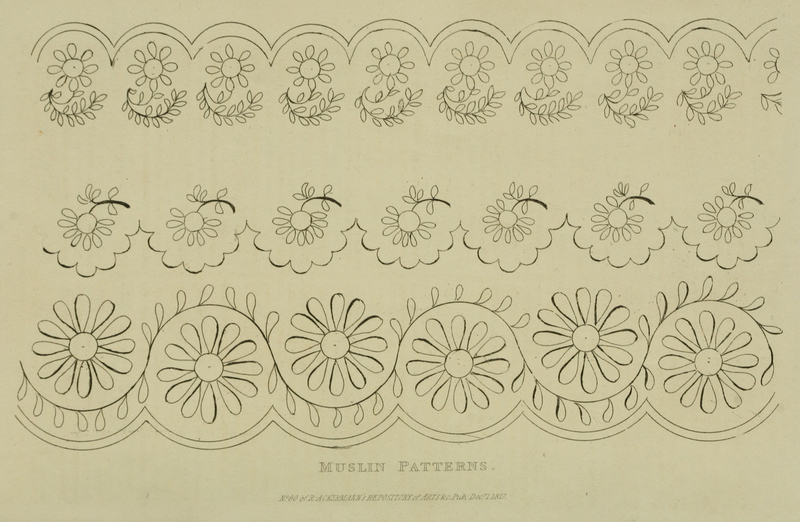 These vintage patterns may not "show" as well on a busy fabric pattern and if you put so much time and effort into the work you probably want it to take center focus. You may want to consider adding a plain fabric band added to the ends of your pillowcases and embroider those. 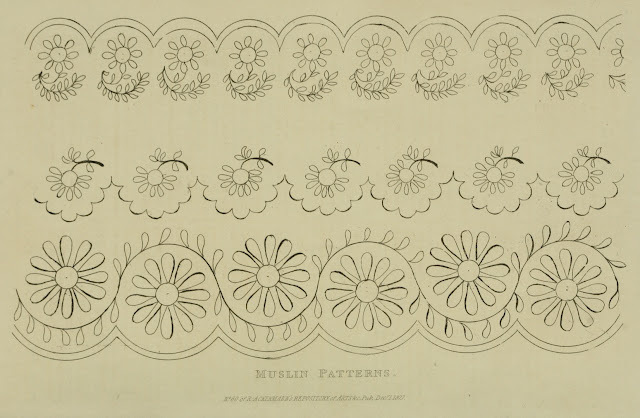 This way you get your patterned fabric on the central portion of your pillowcases and the embroidery will stand out on the coordinating plain band on the ends.